Getting the perfect ‘designer bedroom’ for your little lad can be a chore. Making sure everything is right and perfect takes a while. All kinds of renovation and decoration need to be properly thought out. If they aren’t then you could end up spending more money down the line to rectify problems that didn’t need to occur. Like all decoration, you need to figure out exactly what you want before going ahead, doing parts of the room before knowing what you’re going to do for other parts can be a recipe for disaster. This article gives you some ideas for kids bedrooms and informs you regarding the changes you’re going to make, you can get started planning and think of some great creative boys bedroom ideas. Before you start looking at the room you need to know you have the time and resources to complete the renovation. There’s no point starting something you’re not sure you can finish or your child will be sleeping in a half decorated room. Make sure you have the time and you have the money needed to complete the renovation. If you’re paying someone else to do anything then have the money ready and give them an exact specification so there is not any room for mistake. Make sure to have everything planned out. Furniture, lighting, fixtures, walls, the list goes on. Plan it all out and all the costs out beforehand to ensure you keep it all on track. If you fail to plan you plan to fail! The first thing you’re going to be looking at is the walls. Decide what colour you’re going to paint them. The colour of a kid’s bedroom should be vibrant and alluring. Ask them what their favourite colour is and try to get them involved. Maybe you want to use wallpaper instead of paint. You can go novel here if you like, it all depends on how old they are. You can use fun wallpaper reflecting their interests such as animals, football or StarWars. If you think it is a little too much then only use the paper on one side of the room. Deciding on the walls can be one of the hardest parts of decorating. Once you’ve got your paint or paper sorted then you’ll want things to actually go on the wall. Again, these can be fun poster type things or framed images of things they like, but don’t go overboard. Neon light signs affixed to the wall, kind of like bar signs but less bright, can also be a great way to decorate whilst also providing a type of night light to ensure they sleep well. Like the walls, your lights should be something you think about. Get the shell of the room planned out and decorated before you think about any furniture. The ceiling should be a neutral colour like white, don’t be tempted to use darker colours matching the room or it will look too dark. Deciding on the lights are fairly easy because your child won’t mind too much. If you’re going for a usual light then the light shade can be a fun one, but your best bet is using LED lights. They’re quite popular and look pretty cool, so your child will appreciate them. The wiring can be quite complicated so you may need the help of a qualified electrician. After the walls and ceiling have been planned and completed you can start on the internal components like furniture. When you start looking at beds try to remember to get one bigger than your child. All too often parents buy beds to fit, not remembering boys have sudden infant growth spurts. You could quickly find yourself in need of a bigger sized bed. With boys, you need to try and get something of the cooler variety. They tend to love bunk beds, so consider getting a bed with a ladder attached and space underneath. 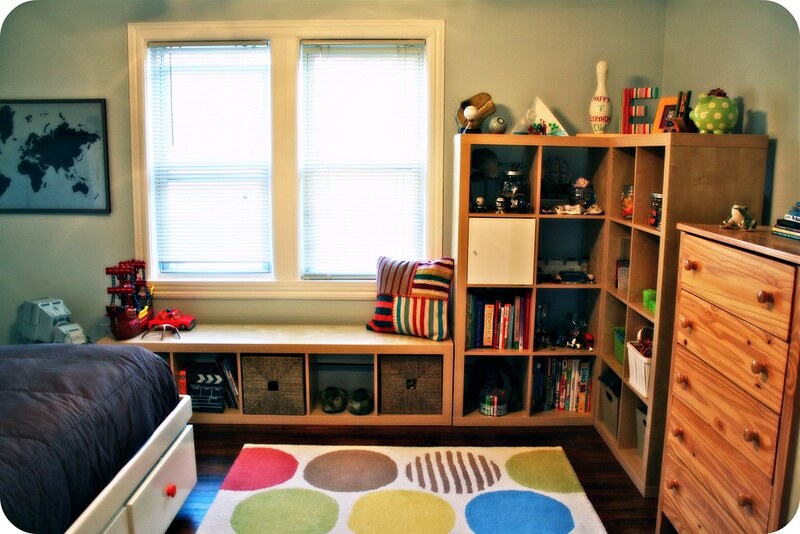 This gives your child a cool space to sleep but also increases the floor space, leaving more room for activities or some extra under bed storage drawers. If you opt for the normal bed, try and get one with additional under bed storage because the number of possessions they have rack up pretty quickly. When you buy the mattress make sure you get a good one, don’t skimp, it is important for a growing body to be properly supported, it is also important they get a good night’s sleep. Again, with the bedcovers you can have fun, using sheets corresponding to your child’s interests. Give him a few pillows too, so he can prop himself up when reading books or comics. The other furniture is incidental, but you need to consider it properly. If you choose a normal style bed then a bedside table with a lamp is a good idea. It means turning the light off whilst in bed easy and hassle free. If the bed is in the middle of the room then don’t get two bedside tables, just the one will do. Consider moving the bed to the wall too, it makes so much more space. A standard chest of draws and wardrobe will be enough space for your son to store all of his clothing, so the other kinds of storage need to be geared for holding toys and games. You can use a chest or boxes to do this, try to get ones that stack atop each other. After this, you may need a stand to hold a TV. You may be averse to putting a TV in your child’s room, but these days everyone does it, just make sure you regulate its usage. A great space saving tip is to affix the TV to the wall. Make sure it is well visible from the bed. Hanging their DVDs from the wall also saves space, there are many styles of racks that fit to a wall. Even a game’s console can be fixed to a wall and gives off a super modern style look, but if they have lots of attachments and the like you may be better off buying a unit to house it all. Remember, if you are changing everything around you may need. Actually, all you really need to do is to personalise the room. Give your child some creative license here. A chalkboard for example, where he can draw whatever he wants, or a board where they can post up photos and the like. If the room is big enough consider putting in a play table where they can sit and play with their toys or maybe a sofa or some similar seating so their friends can play games with them on the TV. If floor space permits how’s about interchangeable cheap pool tables, you can flip them to football or table tennis easy enough and they can be a good way to distract your child from the TV and give them and a friend something fun to do. If they are in their teens perhaps think about putting in a personal computer. These days homework really does require a home connection to the internet. So a PC connected to the internet can help them do the work they need. You may prefer this being downstairs so you can keep an eye on them, but there are various kinds of child locks and protection you can put on the PC to stop them accessing dodgy sites. Of course, the PC will take up some room, so factor this into the planning stage. There are various kinds of child locks and protection you can put on the PC to stop your child accessing dodgy sites! Thanks a lot for your time, I truly appreciate your visit! Great idea’s. I’ve pinned this.